Next Tuesday, July 1st. 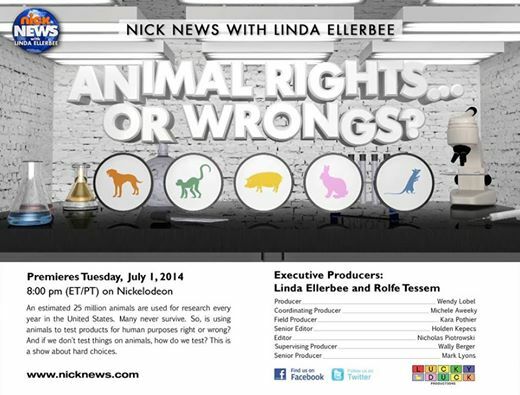 at 8:00pm ET, Nickelodeon’s “Nick News with Linda Ellerbee” will air a program titled “Animal Rights…Or Wrongs?” It promises to be a balanced look at both sides of the use of animals in research. “Nick News” has been on the air for 22 years and is recognized for discussing social, political, and economic issues important to children, teenagers, and adults. On the “pro” side of the discussion will be Dr. Cindy Buckmaster, Director for the Center for Comparative Medicine at Baylor College of Medicine and AALAS Vice President. Dr. Buckmaster has been a longtime advocate for the responsible use of animals in research and has frequently spoken about the need for those in laboratory animal science community to speak out about what we do and why we do it. She has frequently given her talk, “Stop Hiding…and Change the World” at various meetings and conferences. In addition to Dr. Buckmaster, “Nick News” will be presenting the story of Liviya Anderson whose life was saved by animal research when she developed aplastic anemia. On the “con” side will be Dr. Aysha Akhtar, a board certified neurologist currently working for the Office of Counterterrorism and Emerging Threats with the FDA and is a Fellow of the Oxford Centre for Animal Ethics (unaffiliated with Oxford University). She is also a frequent contributor to The Huffington Post arguing against the use of animals in research. Dr. Akhtar has been covered by Speaking of Research in the past here and here. At this time there is no further information available regarding who else may be a part of the “con” side. “Nick News” states its aim is to explore both sides of the story. They will talk to children who have opinions on both sides from those actively working to end all animal research to those like Liviya who are alive today because of it. In addition to the interviews with experts and children, Baylor College of Medicine allowed the “Nick News” crew to film animal in the vivarium including an experiment with a mouse model for Alzheimer’s disease performing a memory task in the lab. Assuming that this segment will indeed be an unbiased look at both sides of the story, it will be interesting to see how children respond to the same tough question we all grapple with routinely: If we stop using animal models in research, then what? We hope this program indeed provides an unbiased look at the issues surrounding the use of animals in research. It’s one thing to argue in the abstract about what, in a perfect world, should or shouldn’t happen. It’s another thing altogether to look a patient like Liviya, or any number of others suffering from debilitating diseases, and essentially say they aren’t worth saving. Although those participating in the program will not likely come face-to-face with real patients or their families in this segment, hopefully those watching will see there are potentially real consequences for real people should animal research be discontinued. Additionally we hope the program doesn’t allow any misrepresentations of the science to go unchallenged or the use of images which don’t accurately represent current research. Posted on June 26, 2014 June 26, 2014 by EditorPosted in News, Outreach NewsTagged Animal Rights…Or Wrongs, Aysha Akhtar, Cindy Buckmaster, TV. Unfortunately when it comes to media coverage of animal research, we’re still reaching towards that false balance scenario so common with climate change. Too often journalists just regurgitate a PETA/HSUS/PCRM press release with nary a mention of the pro-science side. I’m wondering if this is a bit like when major news stations bring “experts” on to talk about climate change. They bring in a climate scientist and a climate change denier, and claim to present a “balanced” look at the issue. Does a program such as this on Nick News present animal research as if it is a continued 1:1 controversy when in reality it is a majority of rational thinkers and scientists versus a loud minority? Anti-sperimentation often explain things using an emotional point of view. Pro- sperimentation usually use rational arguments. What kind of communication will be more persuasive for children? Andrea: Normally I would agree with you on this. However, I know Dr. Buckmaster and one of her big points has been that we in the research community need to appeal to that emotional side when presenting our views. She was instrumental in developing a new series of posters for the AALAS Foundation that emphasis the emotional aspect of caring for the animals. I think she will push that aspect assuming it hasn’t been edited out. We’ll see.